toe attaches to, the 1st metatarsal, becomes prominent on the inner border of the foot. This bump is the bunion, made up of bone and soft tissue. Bunions are often inherited, meaning that there is a strong family history of relatives with bunions. Tight fitting shoes or high-heeled shoes with narrow toe boxes push your forefoot (the front part of the foot, including toes) into a space that is too small for your toes. This squeezes the big toe into an unnatural position, exaggerating the deformity and causing more pressure over the bunion. After time this becomes painful. Bunions can become painful if they’re allowed to progress and can cause problems with the other toes of that foot, not to mention finding and wearing proper shoes. Usually, the pain can be managed nonsurgically: for example, bunion pads or switching to shoes that fit properly without compressing the toes. Splints to reposition the big toe and orthotics (shoe inserts custom-shaped to your feet) may also relieve pain. The most important thing for you to do is to find a shoe that fits your forefoot. To ensure that a shoe fits properly: stand in bare feet on a flat piece of cardboard, like the back of a cereal box, and trace each foot with a felt pen. Next, cut the tracing and take it with you when you go shopping for shoes. If the cardboard outline of your foot does not fit into the shoe, then it is the wrong size – no matter how nice it looks. Before consenting to surgery, it is important to consider the time required for recovery and the disruption to your life. The 1st metatarsal is an important bone in your foot, and it is cut during surgery, requiring recovery of anywhere from 6 to 14 weeks. Most patients can walk on their foot immediately after surgery; but you are not able to wear a regular shoe or walk normally for 3 to 4 months. It may take up to 6 months to get back to vigorous activities such as running. If the recovery time seems too long for you to accommodate, then you may not be ready for the procedure. The primary goal of surgery is to correct the deformity so that the excessive pressure over the inner aspect of your big toe is relieved. It is important to remember that bunion procedures DO NOT significantly narrow the width of your forefoot. This is why it is important to have bunion surgery for pain relief as opposed to the goal of wearing fashionable shoes with a narrow/pointed toe box. 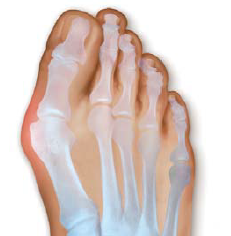 There are over 45 different surgical methods to correct a bunion deformity. Your surgeon can describe the method he or she will use for your specific needs. What they all have in common is that they cut the bones of the big toe (inner border of the foot) which allows the surgeon to correct the bony deformity. Cutting of the bone is called an osteotomy. After the surgeon cuts the bone, it can be stabilized with pins, screws and/or plates if required. You will have bandages to hold your toe in its corrected position. You will wear a special post-operative shoe or removeable cast to protect your foot. Your sutures will be removed about 2 weeks after surgery at a post-operative appointment determined by your surgeon, but your foot will require continued support from dressings or a brace for 6 to 8 weeks. After your dressings have been removed, wear only athletic shoes or soft leather Oxford-type shoes for the first several months until the wounds have completely healed. Do not wear fashion shoes, including high heels, until after 6 months or as directed by your orthopaedic surgeon. Your surgeon will discuss when you can bear weight on the foot and may recommend a walker, cane, or crutches for the first few days or weeks after surgery. You can participate in some exercise programs once the sutures are removed; the level of activity will depend on the procedure performed. It may take up to 6 months for swelling to completely subside.